Dark, intense blue colour with white, paler blue and black streaks. 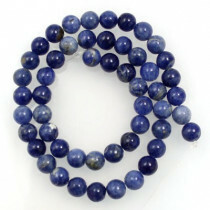 Sodalite has been discovered in ancient tombs and ruins in various ornamental forms, often as a replacement for lapis lazuli. 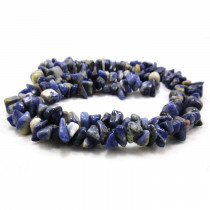 It is said that Egyptian priests often used sodalite to dispel fears and to promote a clear, insightful mind. Said to help change the way you feel about yourself. It is believed to have subtle, soothing energies to help you to see the wisdom of adopting a simpler, less hectic lifestyle. 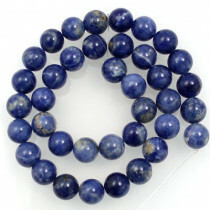 A-Grade Sodalite stone Round 6mm (~66pce Strand) - 40cm/16'" Strand. 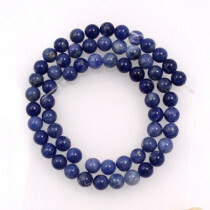 A-Grade Sodalite stone Round 10mm (~40pce Strand) - 40cm/16'" Strand. 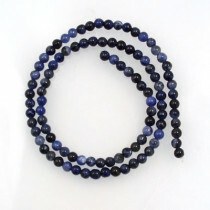 Sodalite Large Stone Chips 8x12mm (~150pce Strand) - 91cm /36'" Strand.